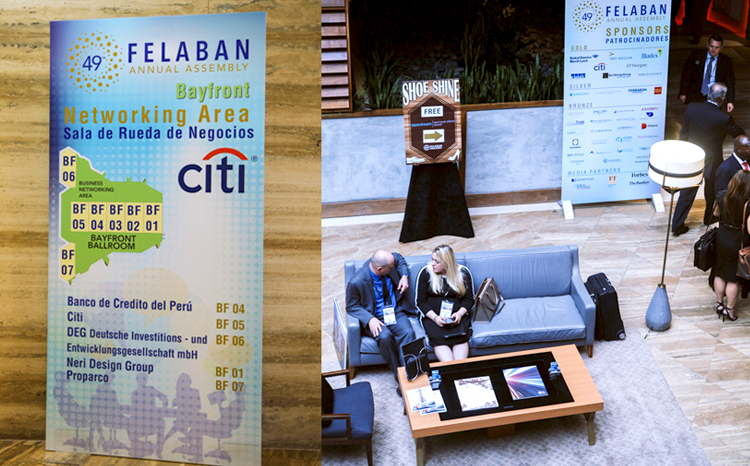 The Annual Assembly of the Latin American Banking Federation [FELABAN] is recognized as the Latin American event with the largest and most prestigious business meetings in for senior professionals in the financial sector. In 2015, I worked as part of a team while working in Brand & Design Agency, Neri Design Group as one the designers and organizers of the event. 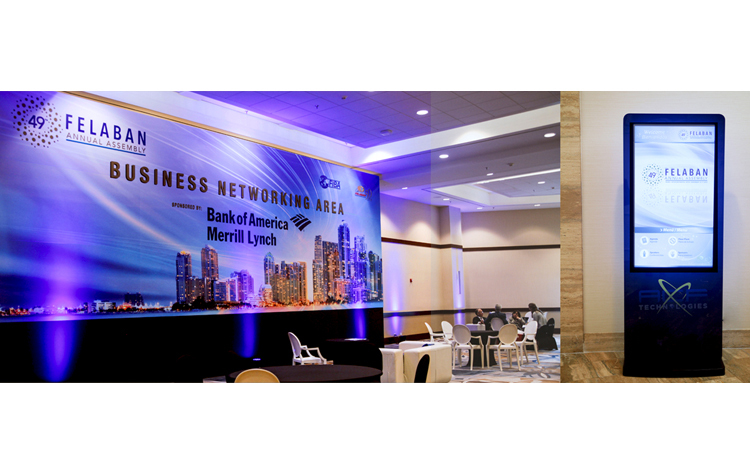 The event celebrated FELABAN and the Florida International Bankers Association [FIBA] 50th Anniversary. We wanted to break the old paradigm and project an image of renewal, freshness, technological and digital innovation, which reflects the current banking trends. The project entailed the development of the creative concept of the 4-day event, to support its implementation, and thus connect participants worldwide and provide a more dynamic and interactive experience. To develop the creative concept and image to support the event, integrating all communications, from the beginning preparations to the event’s closure, and setting the standards for graphic and design direction of all the items involved: information booth, traditional and digital signage systems, meeting areas, "look and feel" of the website. My core responsibilities were to design the logo, website and to design collaboratively with another designer the printed and digital signage systems along with marketing materials. We came up as a team with the concept behind the logo, which was Connecting Constellations. Through the use of elements such as the circle and spirals I wanted to convey connection and dynamism in the design. 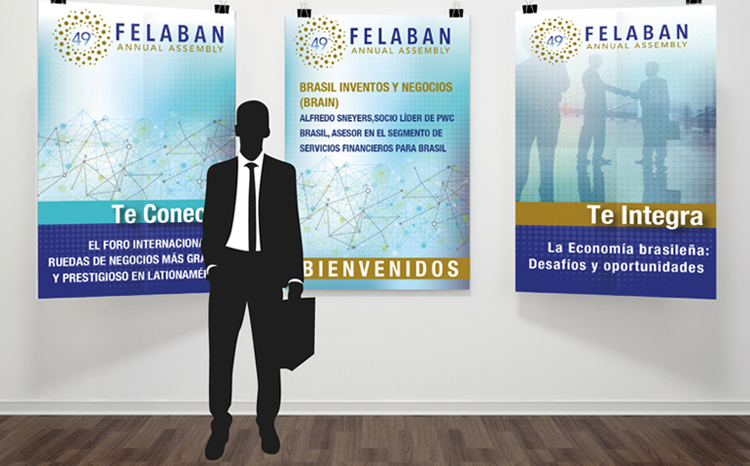 Bringing to life the idea of Felaban Annual Assembly, serving as a meeting point and experience for all people involved in financial services to meet. 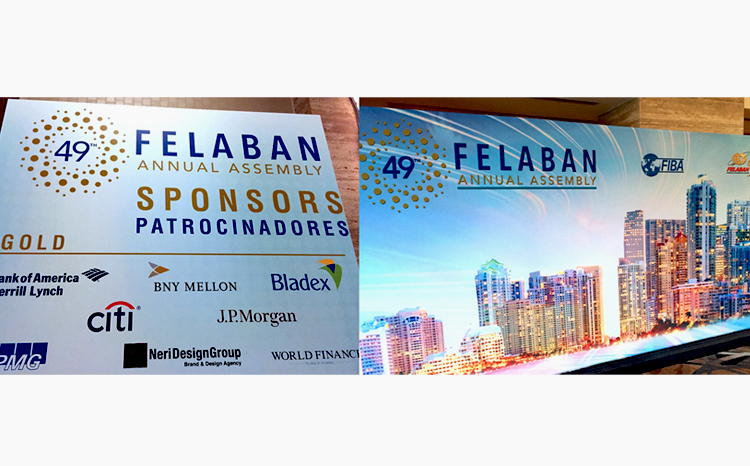 FELABAN’s 49th Assembly was a resounding success, reaching the record number of participants of 1,950 people. As for the graphic elements, we selected a color palette with blue tones, which represents the technological incorporation, and combined it with the color gold in honor of the Golden Anniversary. This fusion created a connection between the innovative yet conservative nature of the institution, showing the variety of their nuances and creating a timeless, friendly and modern image that conveys the elegance and prestige of the Assembly, as well as FIBA and FELABAN’s. Moreover, a grid of interlocking points represented the connection between different countries, institutions and participants gathered in one place. The concept and the image developed were effectively implemented in all communication pieces, marketing elements, signs and spaces where the event was executed; aligning these activities and productions to the creative concept and responding to the proposed strategy.